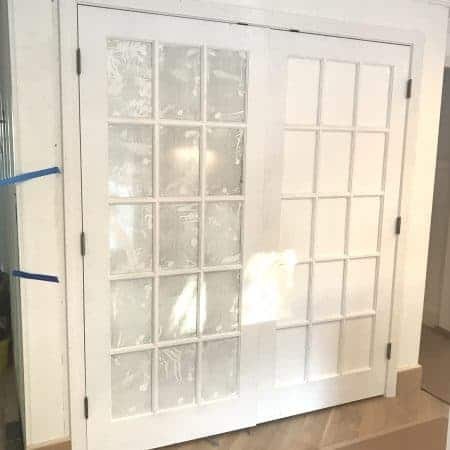 I have read about 47,937 This Old House tutorials, mulled over options, and walked the aisles of my favorite hardware stores in thinking mode, for what add up to many (many) hours of my life. I find it thoroughly gratifying to find an out-of-the-box solution to a problem, but the thing is, sometimes it’s not necessary to reinvent the wheel. Which brings me to…..wheels. Or casters, if you may. My little Seanie-Mark, boy of a thousand nicknames, has the teeniest bedroom in this house. In our last house his room held two twin beds, and the second bed was utilized for many a sleepover with Sean’s siblings, friends and cousins. In this house I thought we’d use the second mattress for a trundle under Sean’s bed. — but honestly, I don’t love it. 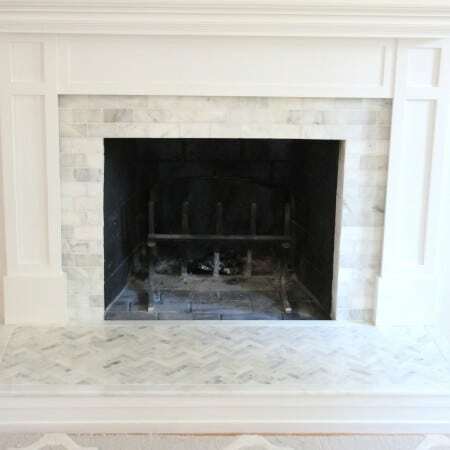 The metal edges are exposed, and trust me, they are painful on unsuspecting toes! Every time Hannah has a sleepover I stuff bedding and socks all around the metal parts so our guests won’t get maimed. (We bought Hannah’s from the same furniture store that we got her bed at. Here is a similar one. 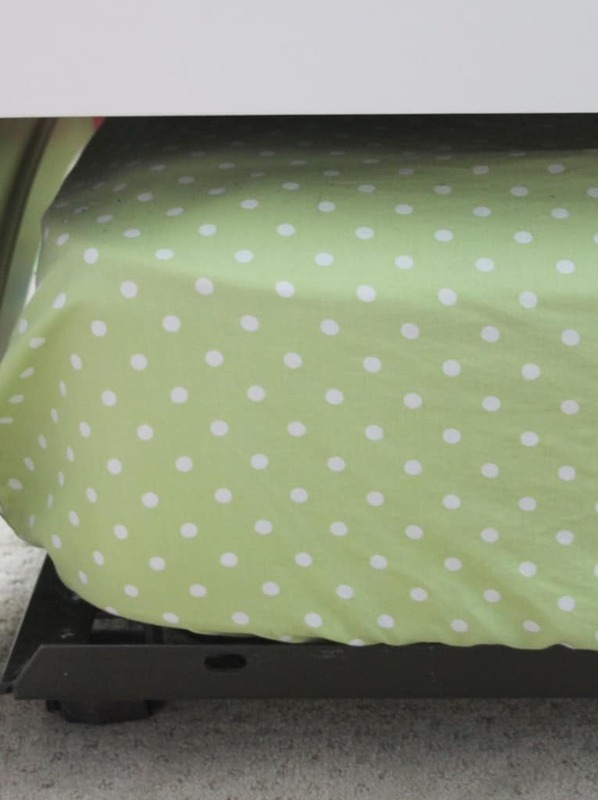 Sarah at The Yellow Cape Cod posted a great tutorial on DIYing a trundle bed base by adding casters to a sheet of plywood – a much more economical and tootsie-friendly idea than the metal version. With Sarah’s trundle base in mind, we brought the extra mattress from up from the basement, only to discover that it barely fit under Sean’s bed frame; forget about placing it on a plywood base with casters. However, having the extra mattress is so great for sleepovers (or when we have overnight company and I kick my other kids out of their beds! ), so we decided to keep it in Sean’s room. 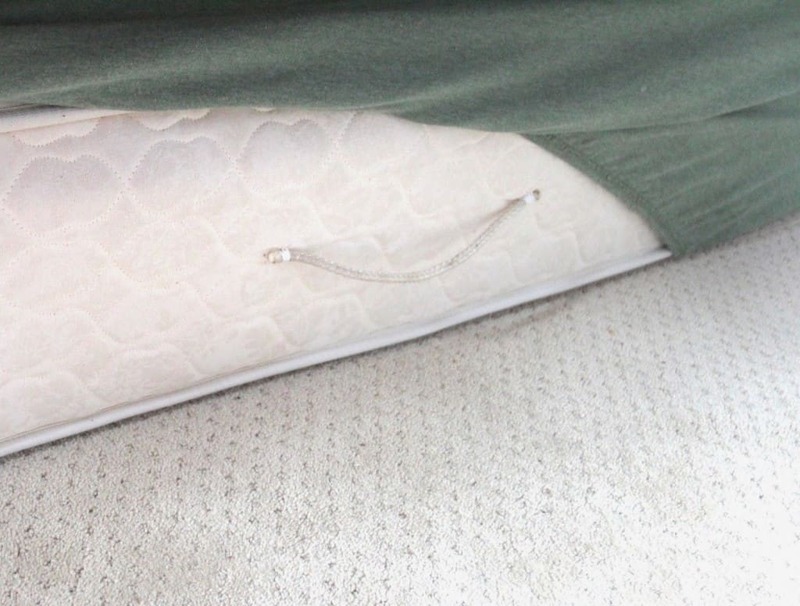 To pull it out, two people have to grab hold of the end of the mattress and pull with all our might. 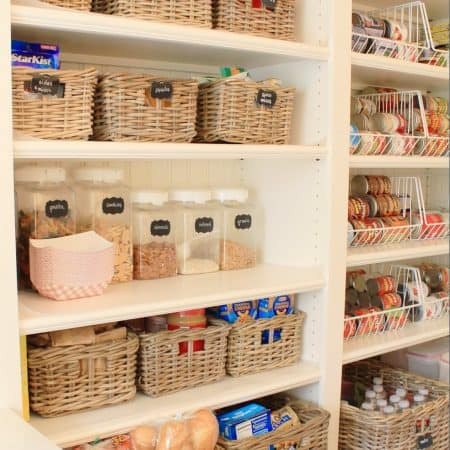 It’s kind of funny to think of how long we have lived with it this way, considering how much we use it! 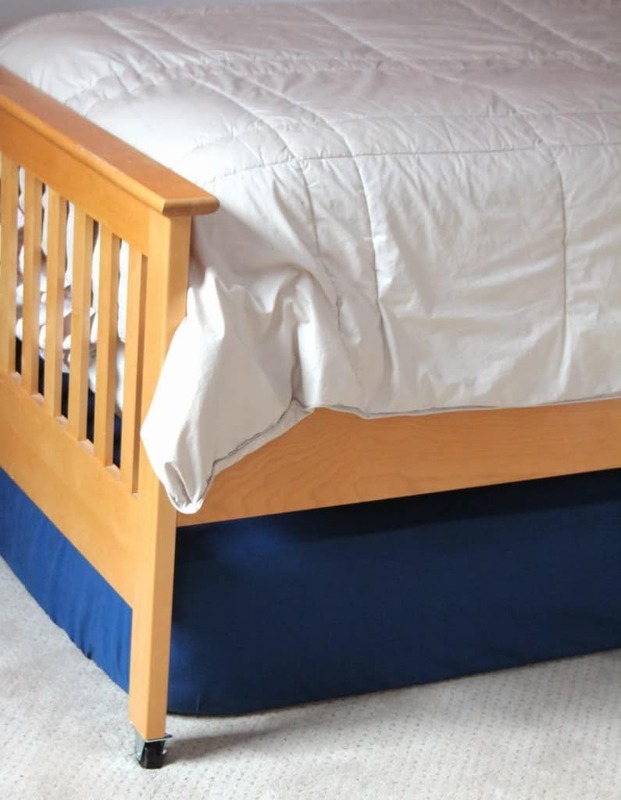 Clearly the bed had to be raised, but since the legs of the bed are exposed, the plastic bed risers I used in my older son’s room, or the wooden DIY bed risers I built for my bed, weren’t going to work. I thought about adding some kind of wooden support block to each leg, stained to match the bed. Maybe cutting off the legs, and adding longer ones? A little drastic, even for me. 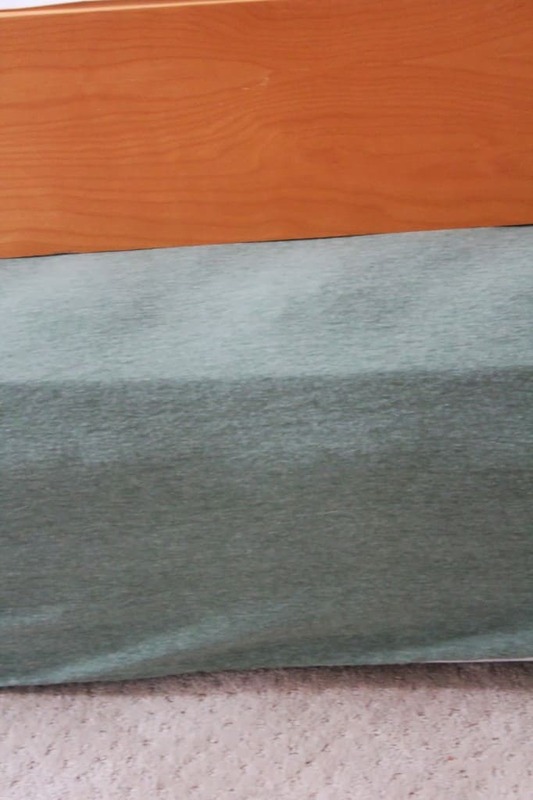 Buying a thinner mattress for the bottom? Okay no. Put the legs on risers and add a bedskirt? Hmmm. Every time I have had to put that mattress away I have mulled over how to add some length to those legs. 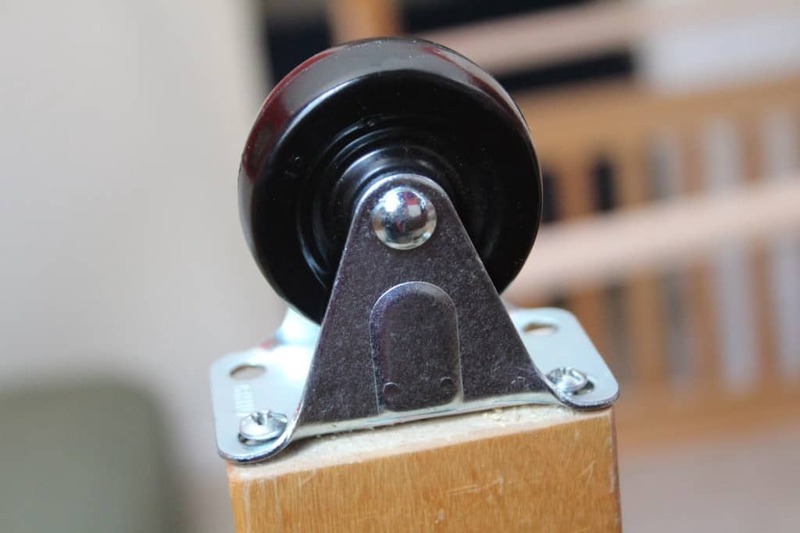 Finally – a lightbulb went off – use casters to raise up the bed frame. A little bit industrial….perfect for a boy’s room. All I did was take the mattress and boxspring off, flip the bed frame over (it’s not heavy), predrill holes, then add the casters to each leg. I could only attach screws on one side of the caster because the legs were so narrow, but they are on there nice and snug. 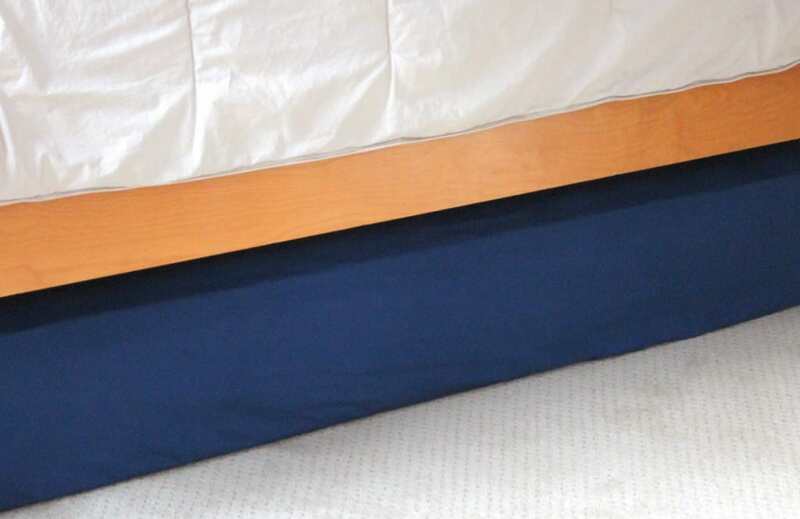 NOTE: If you are doing this, get the casters that have a lock on them to minimize the bed rolling back and forth when your munchkin jumps on it. 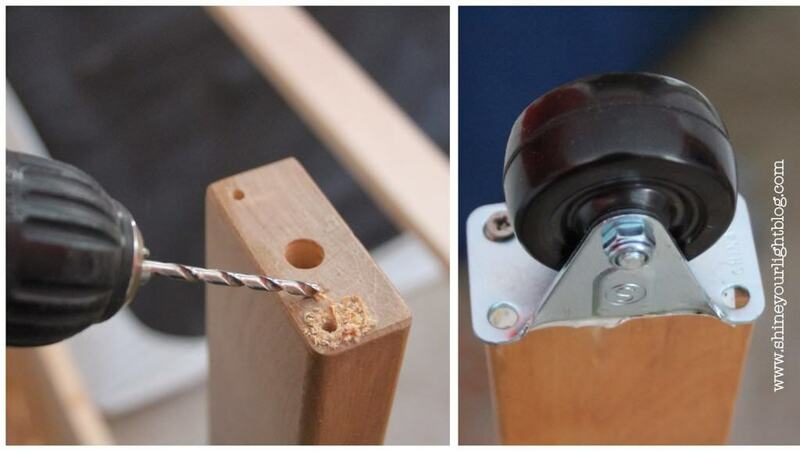 Be sure to pre-drill your holes so the screws don’t cause the wood to cracks. These are the casters I used. 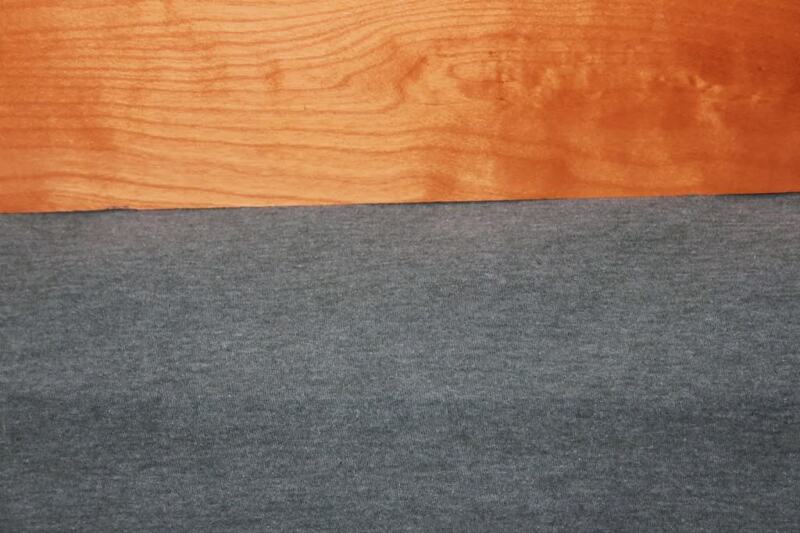 BAM – 2.5″ of height added to the bed frame. 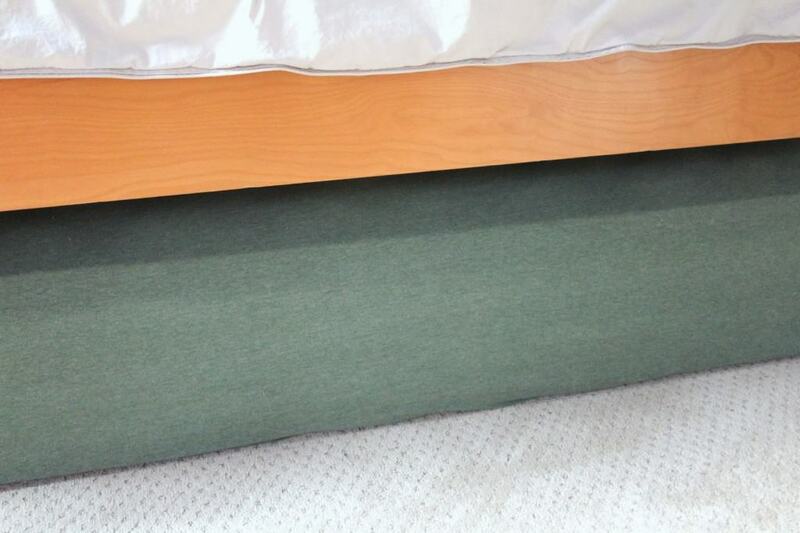 With the casters attached, the bottom mattress fits under there with plenty of room to spare. After the raising of the bed problem was solved, I moved on to over-thinking how I could add a very thin platform with smaller casters that would fit under the bed – BUT – after pushing and pulling the mattress out a few times with Sean, we decided it was easy enough to pull out without a platform on wheels. To make pulling it out a little easier, I found some nylon rope in our garage, cut and burned the edges so they won’t fray, then doubled up some heavy duty thread and sewed the rope onto the side of the mattress as handles. 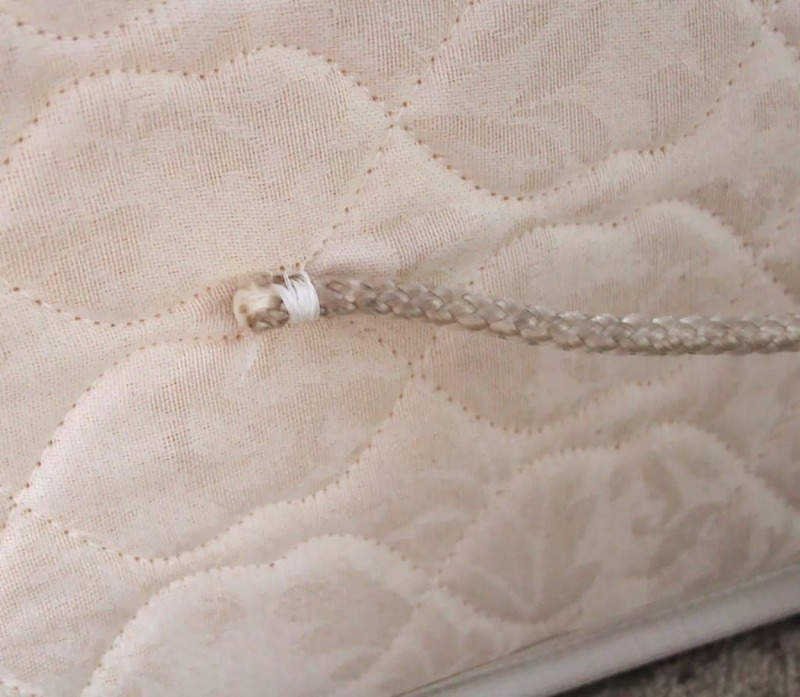 The fabric on the mattress is pretty thick and I attached the ends of the rope with many stitches to reinforce them. I added two handles. We’ve pulled out the mattress maybe 10 times already and the handles are nice and secure. 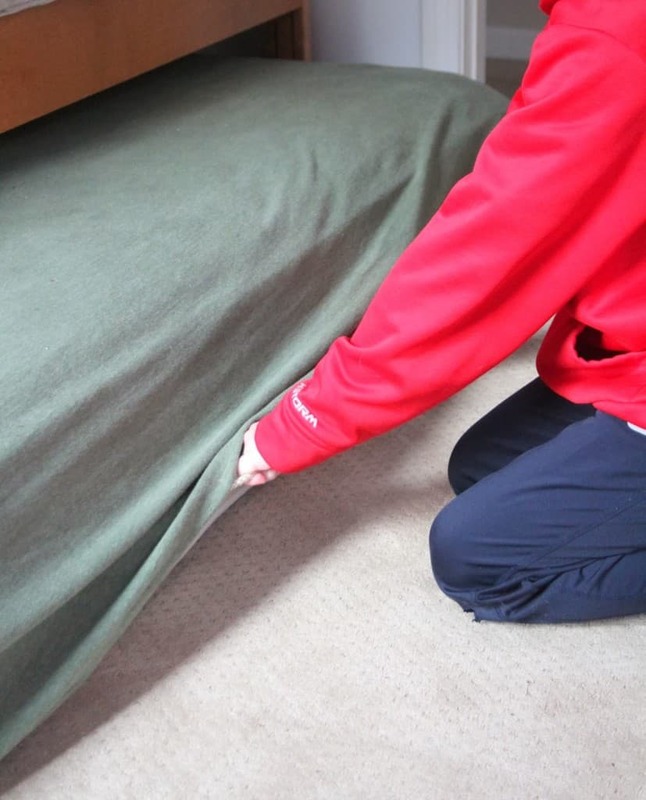 Pushing the mattress back under is easy – Sean can do it himself in just a few seconds now that there is no stuffing involved. While we’re at it, let’s change the sheets, shall we? All ready for the next sleepover. An easy solution, my favorite kind!! Great solution, Lisa! 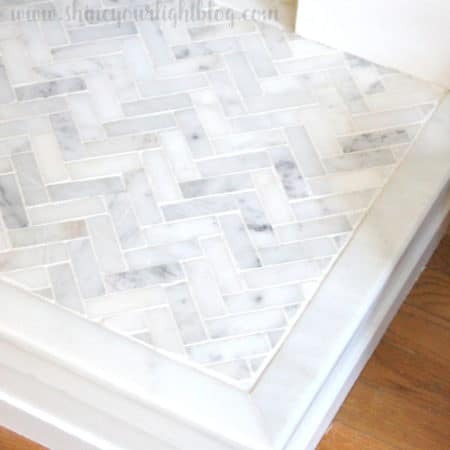 I'm still on the hunt for a trundle-ish bed, or even a daybed that I can make into a trundle with your methodology. This is great! Gotta love trundles, don't you? This is such a great idea!! Especially because I'm not a big fan of dust ruffles. Especially in boys rooms! Hooray for no more stuffin'! Great idea, Lisa. You're such a smart girl! 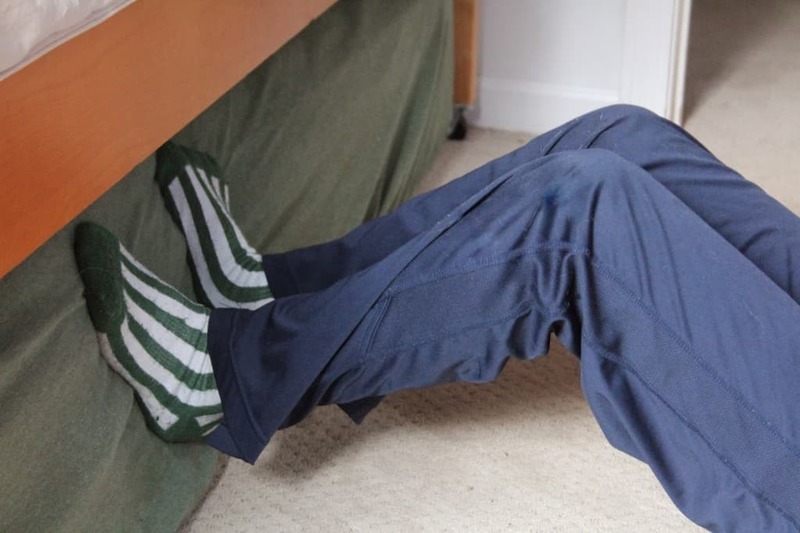 And it would be great for beds pushed against the wall – you could unlock the casters to roll the bed away from the wall and more easily change the sheets! You are so clever! 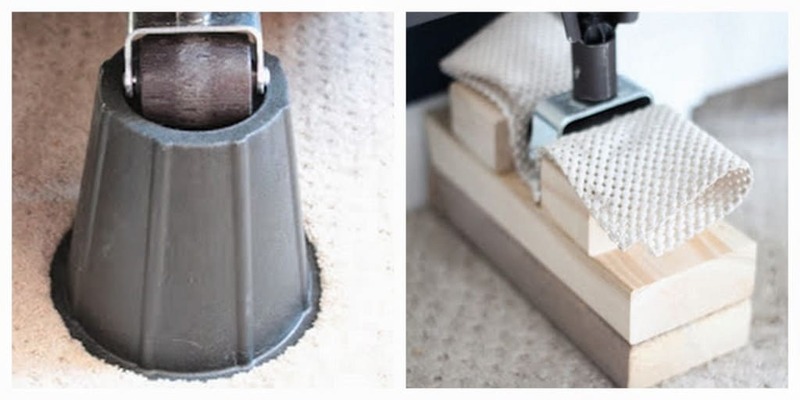 I love those casters, they come in handy for so many projects! 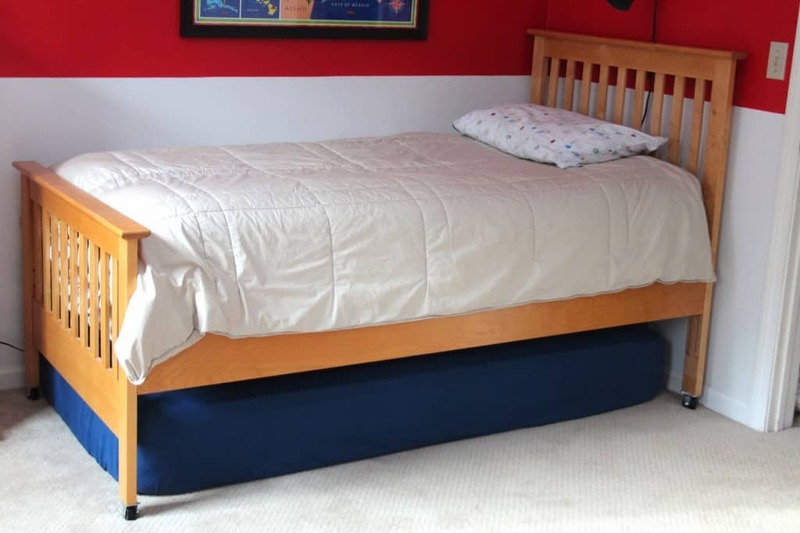 Never thought about keeping an extra mattress tucked away, that would be so useful!